Ryan Briscoe and Graham Rahal set up for Turn 3 during practice for the Iowa corn 300 at Iowa speedway. Photo by Chris Owens. champion for 2015. And it will do so in dramatic fashion, because the Sonoma race will pay DOUBLE POINTS to the winner of this one round. 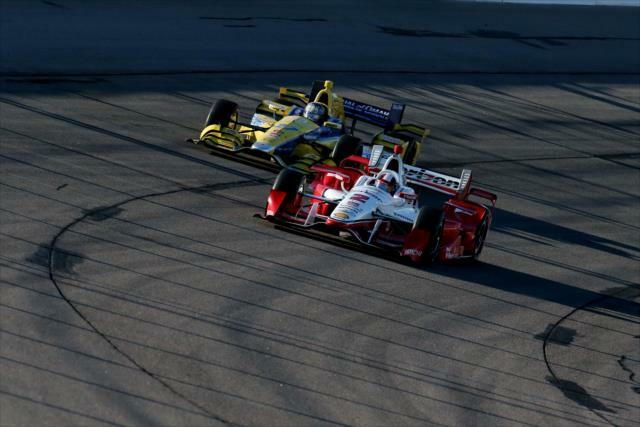 Unlike NASCAR and NHRA which prolong the championship battle over an extended series of playoff events, IndyCar is content to let this one round at Sonoma decide their season title. 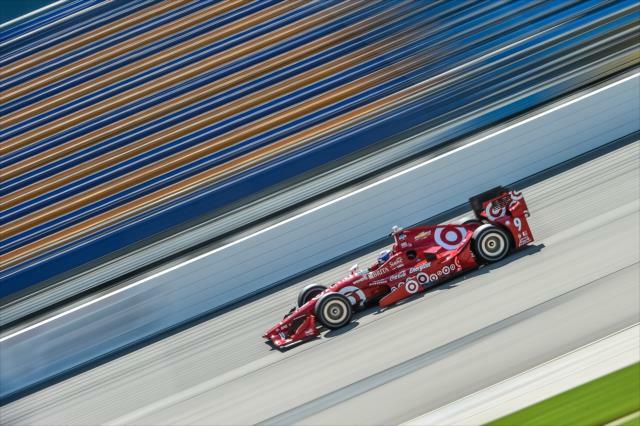 circus reached Iowa for the Iowa Corn 300 on July 19, Montoya had amassed a seemingly insurmountable 54 point lead over his nearest competitor, Team Ganassi driver Scott Dixon. However, Iowa changed all that when Montoya exited the race and wrecked his Penske on lap 10 due to a suspension failure. 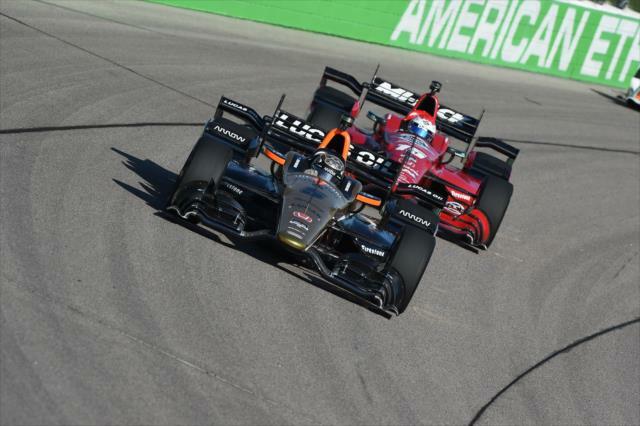 By the end of the night, Montoya's comfort margin had shrunk to just 42 points over new second place holder Graham Rahal, son of Indy 500 winner Bobby Rahal. Dixon fell to third, 48 points adrift. With 3 races yet to run, and the Sonoma round paying double points, you can be sure the GOPRO event will display the kind of finality fireworks it has never before enjoyed. This year, for the first time ever, Sonoma Raceway is offering to take you direct to the race via rail. If you'd love to attend, but dislike the prospect of sitting in traffic on Highway 37 or battling for parking once inside the track, then think about taking the train to the race on Sunday, August 30. This run starts in Sacramento, makes a stop in Fairfield, and arrives just outside the speedway gates in plenty of time to enjoy Sunday's shoot-out for the IndyCar title. Those of you who happen to be rail buffs as well as race fans will be fascinated to learn that the race train covers track mileage from Fairfield to Sonoma that is NOT part of any Amtrak or Caltrain scheduled service. If you've never attended an IndyCar race at Sonoma, here's a veteran's quick guide to the track and your best viewing spots. If you can make it to practice on Friday or qualifying on Saturday, try to start your adventure with a quick run through the garage area. Slip your hiking boots on, and amble up the rather steep hill to Turn 2 for a terrific panoramic view of the whole 12 turn, 2.38 mile road course. From here you can see Vallejo. Stroll across the spectator bridge between the paddock and Turn 1 for a close look at the 180 degree Carrousel Turn 6. Our favorite spot on the circuit during the practice days is the chicane IndyCar uses in lieu of Turn 10. The grandstands on the backside of the dramatic Esses (Turns 7/8/9) let you view the Dallara race cars as they crest a rise on the back straight at 140mph and brake down to 30mph for the quick right-left immediately in front of you. The chicane is without question the most exciting spot to watch these cars and drivers perform at full tilt. But for the race itself, you'll get a better picture of what's happening if you hike up to the Dale Earnhardt grandstand at Turn 2. The track provides comprehensive bus service to all points on the circuit from the main paddock area. Chose comfortable shoes, carry lots of water, and pack a radio with earplugs to pick up the trackside commentary. Long pants and shorts make a dusty day in the sun easier to take. If you've forgotten to bring a windbreaker, you'll have ample opportunity to buy one from the many team concessionaires in the fascinating paddock.